On Wednesday Serenity went to the marina. 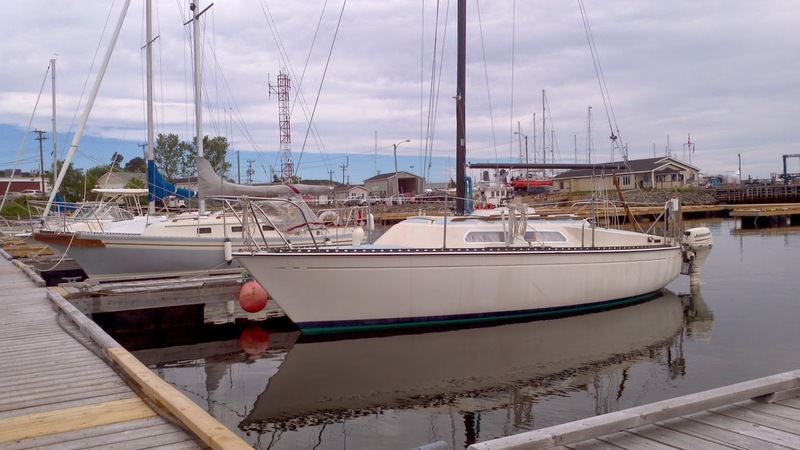 With the most important pre-launch jobs completed, I no longer needed it in my driveway, and it was time to think about going sailing. The engine and rudder were attached, and everything was put in place for stepping the mast, but it was too wet and windy to attempt. On Thursday conditions were better, so with the help of Byron and Mike, the process went smoothly. Now preparations were begun for launching. On Friday morning Serenity was launched with help from Peter and Byron, and a couple of passers by. With the tide falling we had to be quick. Another issue was having Serenity too far back on the trailer. With the angle of the ramp, the bow wanted to lift, so Byron had to stay aboard while the boat was let back into the water. In the afternoon, the rigging got an initial tuning, and the jib was installed. 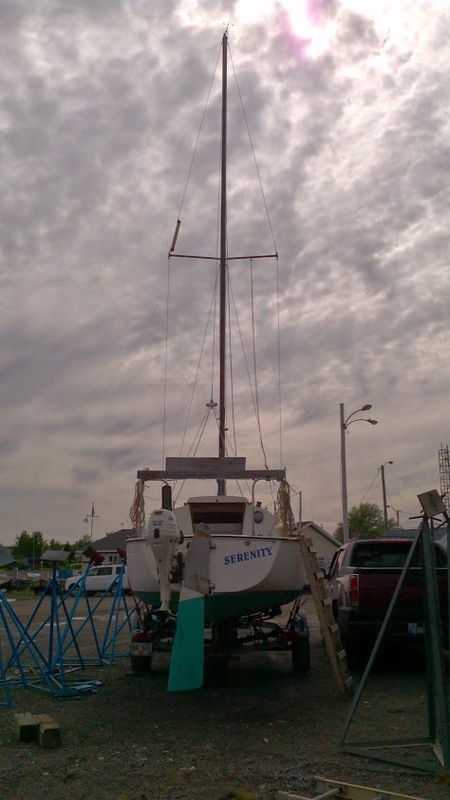 The boat will have to do without the mainsail for a couple of weeks, but this is the earliest in the season that Serenity has been on the water. It is usually a week or more into July. I'm going to aim for launching in May from now on. I've already missed a few good sailing days. Since my main is away to be refurbished, I had arranged to borrow one. I checked on it, and discovered that even though it is from a smaller boat, the foot is longer. I guess that the PY23 has a higher aspect ratio than an Alberg 22 at 7.5' vs 9'. Looks like I will be sailing on jib alone for a while.